Start a new Toyota Camry Solara question. How do I remove the rear seat bottom? How do I go about trading in car, it's still being financed. The Camry Solara is a 2-door coupe based on Toyota's best-selling 4-door sedan. 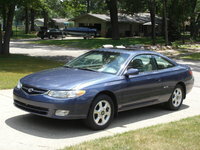 First introduced in 1998, the second-generation Solara went on the market in 2004. 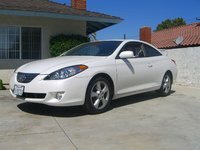 The Camry Solara is a sporty car for Camry fans who want something a little flashier than a sedan but still want the reputation and reliability of the Camry. 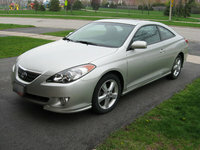 The Camry Solara started out life simply as the Camry Coupe and was part of the Camry lineup. 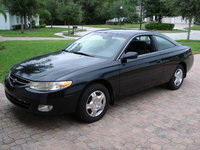 Toyota discontinued the Camry Coupe in 1997, but introduced the Solara in 1999 to compete with the likes of the Honda Accord coupe and the Chrysler Sebring. The Solara looks quite different from the Camry sedan, and while they share an engine, the Solara has a stiffer suspension. It is also available with sportier options, like 17-inch wheels. 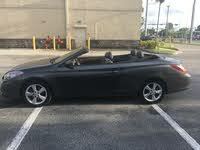 The Solara is also available as a convertible. 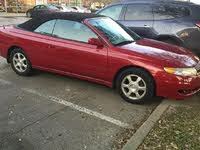 The Solara is marketed as a sports car, but doesn't have the same kind of appeal as the Supra or Celica. It has a bit of a reputation as an old person's car.